Boiler Replacement - Replacing boiler to new ‘A’ rated condensing boiler. Replacing Radiators - old radiators generally have sludge deposits in them reducing efficiency. They may also contain more water therefore take longer to heat up than new convectional radiators. Install thermostatic radiator valves - Controls flow rate to each radiator allowing you to vary the temperature in each room. Install control zone valves with programmer and thermostats - Allows you to set independent time settings for your hot water and central heating. Install high efficiency hot water cylinders - Heats up the hot water quicker with quicker recovery times thus reducing the length of time the boiler is running. Magnaclean® is a powerful, compact magnetic filter designed to remove 100% of suspended Iron Oxide and other particulate from the water circulating through the heating system. 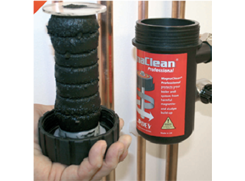 The Magnaclean filter is fairly simple to install providing a very cost effective way to maintain the efficiency of your heating system. Over time your central heating system will suffer from deposits of iron oxide (sludge). These particles bond to all components in your heating system often causing premature failure to pumps and valves as well as decreasing overall efficiency. 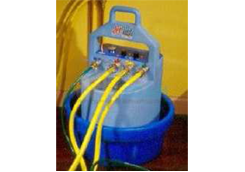 A powerflush removes the debris from your system and restores efficiency. Removes sludge and debris in the system. Improves heating efficiency – saving money. Increases life span of boiler and controls. We also offer a range of greener heating solutions for the home, the most popular of which is the underfloor heating. You can save space whilst sourcing your heating energy more efficiently.